These are the spectral lines of hydrogen... or are they? While pondering the acquiescent essence of diethylether - you know, like you do - it came to mind that every atom is most thermodynamically stable with 8 valence electrons. 3 Wait, hydrogen isn't the only atom that requires two electrons, what about helium? 4 So who is impersonating hydrogen? 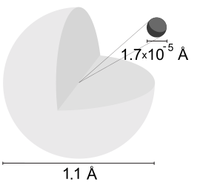 A hydrogen atom has a diameter of 1.7x10 A = 1.1 Angstroms (or at least, that's what the history books say - but remember, history is written by the victors). Of course you wouldn’t know about this, it’s just what the impersonator wants you to think!! But naturally, I will explain it to you. It’s really quite simple, when you get down to it. As everyone knows, hydrogen is the most abundant substance in the known universe. It accounts for approximately 100% of the reality which we see, hear, and taste everyday (rounded off to the nearest half-percent, that is). Stars in the main sequence are mainly composed of hydrogen in its plasma state, and even mayonnaise is made of hydrogen in its condiment state. So this begs the question, why wouldn't someone, or something, want to impersonate hydrogen? Think of the power you'd have. There's another twist in this tale!! Hydrogen isn't quite as abundant as science likes to think!! Take a look around the room you're in now. How much hydrogen can you see? Four, maybe five isotopes - at best. Even looking around my lab now, I can see wood, plastic, metal, leather, polyvinyl chloride, more leather, quark–gluon plasma, imitation-leather and even more leather. No hydrogen at all!! Blind hydrogonologists will tell you that naturally occurring elemental hydrogen, and even gaseous dihydrogen, is relatively rare on Earth. All I have to say is: how convenient!! Don't let those smiles and bald spots fool you, these men are devious imposters. There is simply no other explanation; hydrogen must be being impersonated by a charming, possibly handsome charlatan. This isn't outside the realms of fantasy. You've got to remember that there are recorded attempts at impersonation. 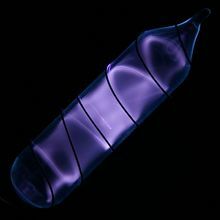 The first attempt at the impersonation of hydrogen occurred in 1909 when Ernest Rutherford designed an experiment which, if successful, would allow him to phase through solid objects as hydrogen, as well as harness its already immense power. Rutherford shot hydrogen atoms at a thin sheet of gold foil to test this theory before beginning his impersonation. However, Rutherford discovered that atoms were structured much differently than he had originally thought, causing him to scrap the project. 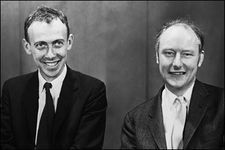 The second and final attempt took place in the 1950's and was by James Watson and Francis Crick. Both scientists strived day and night to find the best way to eliminate hydrogen and replace it with themselves. They failed when Watson betrayed Crick, leading Crick to search for more sources of hydrogen to impersonate. Crick's search paid off in the discovery of DNA, a major source of hydrogen. These attempts, though valiant, would have failed anyway as hydrogen may have been being impersonated long before the 1900's. 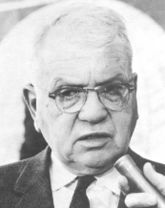 Harold Urey discovered another form of hydrogen: Deuterium - twice as big as regular hydrogen!! Could the impersonator be hiding inside it? Wait, hydrogen isn't the only atom that requires two electrons, what about helium? That's a good question. I have another for you; who'd want to impersonate an inert element? Can you tell me that eh, Mr. Naysayer? I mean, hydrogen has almost infinite power. Hydrogen bombs are the most devastating weapons on the planet, have you ever heard of a helium bomb? I think not. Impersonating helium would get you what? Control over maybe a few balloons, and a zeppelin that'll never leave the hanger!! Who would want that? No, only hydrogen would be worth impersonating. That's why we need to answer the question "who is impersonating hydrogen?" So who is impersonating hydrogen? Well, that's a difficult question. It's possible that nobody is impersonating hydrogen. No wait, forget I said that. Someone is definitely impersonating hydrogen, we just don't know who yet. I have alerted several of those in my field to this possibility, but those fools can't see the truth!! But never fear, as Sherlock Holmes said, there are always clues. Yes, I'm pretty sure he said that. It would have to be someone who knows a lot about hydrogen... someone with lots of scientific equipment and the desire for power... possibly someone who works in the field of science... someone like, well, me. No, surely it can't be. I mean I-I've dedicated my life to finding the culprit!! You believe me don't you? Boyle's law!! They've gotten to you too! !